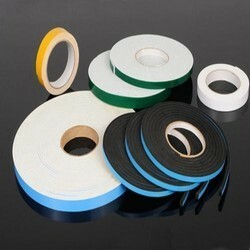 We provide Double Sided PU Tape manufactured using raw materials selected using strict quality control measures. Our range finds application in general purpose bonding. This Product is know as BC Fix Foam Tape. Glazing Foam tape is used to create the inside (and sometimes the outside) seal between the insulated glass panel and window sash or door material, preventing air and water leakage. It is more commonly used in vinyl and aluminum windows and doors, although it can be used in wood windows and doors as well. Double Sided Foam Tapes is a double sided foam tape with rubber based adhesive having high tack and holding power, excellent for general purpose mounting and joining applications such as hook, hanger loading upto 2 kg / 25 mm2. EVA foam coated tapes are available with paper liner. 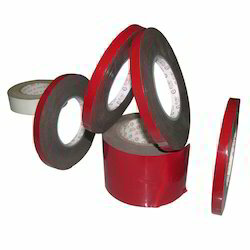 These tapes have water based acrylic or solvent based acrylic adhesive for proper adhesion on various surfaces. The tapes can also be customized on foam thickness and adhesion levels.